The joy of learning a new skill. When I first set out on my venture to teach what I know it was with the clear intention of teaching from the heart. It's hard to resist these beauties (look at their paws...I love it!!!) and with the excellent tuition of the talented Lydia Needle you can make one at the 'Atelier' in Box. Easter is just weeks away so I have created these beautiful, soft felt Easter Eggs to share with you. Easter Eggs come in all shapes and sizes, full of chocolate or not, but these delicate beauties make the most wonderful decoration for Easter Day, to hang on Spring branches for your Easter table, piled up in a basket or hidden, alongside their chocolate cousins, around the garden. Not only do they look and feel wonderful - they also are really creative and very good fun to make and leaving you with a great sense of creative achievement. I am offering Easter Egg Felting Workshops at The Atelier from this Friday and throughout the next few weeks until Easter Sunday. The workshops are open to adults and children (age 8 and over). 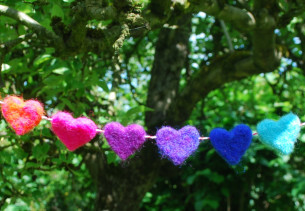 Places are limited to just six per workshop and they last two hours, you will have the opportunity to work with the Felt in many colours and make an Easter Egg (or two) to take home and keep. All the wool, Polystyrene eggs and needles are provided together with lashings of tea and home-made cake...have a look here to book your place for just £20. 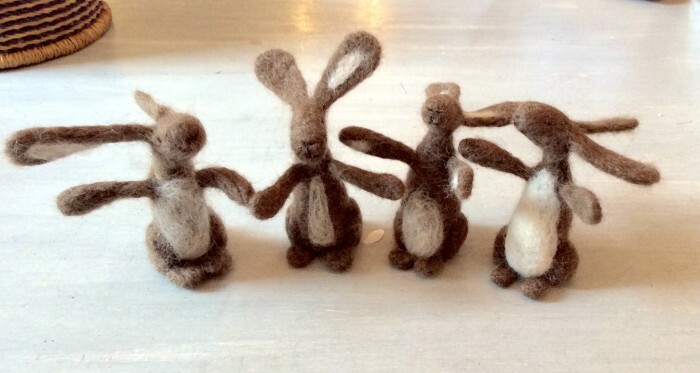 I have also been asked to host a Easter Egg Felting Workshop exclusively at The Barn Gallery, Church Farm, Kington Langley - so if you live in that area and would like to bring your children along to this exclusive workshop - find out more here. I've had a wonderful day gathering together lots of sumptuous felt as I prepare for the upcoming Christmas Felting Workshops. Yes I know it's October but christmas will soon be upon us and to get us in the mood I've rustled up a few examples of the sort of tree decorations you can make in these 2 hour workshops. Places are filling up fast but if you would like to join the fun then you can book your place here!